I have been to many women’s motivational speaker events and have loved most of them, but this one…this one sounds AMAZING!!!! A couple times a year, I sit with the kids and we create vision boards or bucket lists and hang them in our dining room and we watch them come to forwishen. From trips to kitchen remodeling to fulfilling personal goals. This event brings all that and more in a women’s full day event. It’s called Dream Tasting Adventure. I LOVE the name! Love it! This isn’t just a room filled with motivational speakers — this is a day filled with over 50 activities covering 10 different categories. I’m trying to juggle my calendar in hopes that I can possibly make the event with a friend. Would you like to go? Please read more about the event in a post I made earlier HERE! I was offered 2 tickets to give away to my readers. So, make room on YOUR calendar for this life changing event! This is going to be a very quick giveaway seeing time is of the essence. Winner will be chosen Thursday evening and will have a short window of time to claim prize. Tickets will be held at the event and you will need a valid form of ID to claim them. 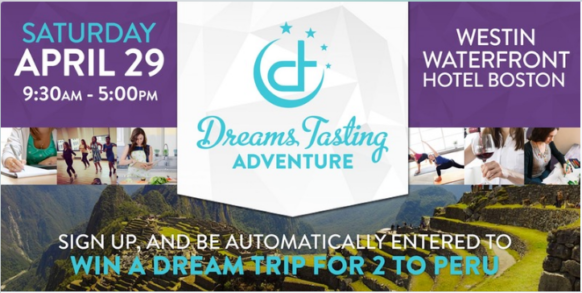 Please visit Dreams Tasting Adventure HERE and then come back and leave a comment with a goal or dream you wish to attain. Leave separate comments for each for more chances. We will use Random Number Generator to choose the winner. Please note that comments need to be approved, so you may not see them right away. Good luck my friends! I’m very excited for you….and for this event. To leave a comment, scroll down to the end of this post. Good luck! Oh and get your girlfriends to read about this and enter too. One Response to Boston Women’s Event Giveaway!!!!! My goal is to start a non profit to empower foster parents + eventually the greater community by giving away gently used items that people are in need of.